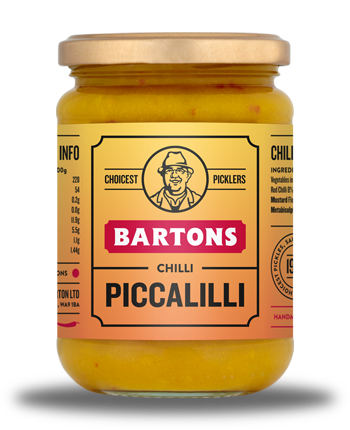 Bartons Chilli Piccalilli is a mild mustard, turmeric and vinegar based sauce with the addition of chopped onions and cauliflower florets and fresh red chilli to make a hot relish type chutney. It is a very popular, great eaten with cold meats such as ham, sandwiches, snacks and salads. 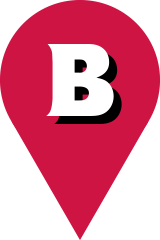 It is an ambient product available in glass jars with a two year shelf life from the date of production. Once opened it should be kept cool place and away from bright light and will last up to 6 weeks. For those who need more than a jar, we also have catering sizes. Vegetables in variable proportions (cauliflower 23% (contains sulphites), onions 23%, red chilli pepper 8%), water, barley malt vinegar, cornflour, sugar, mustard, turmeric, acetic acid, salt.